The Hunters full moon marks the peak of Autumn before the winter chill kicks in along with a dose of reality. 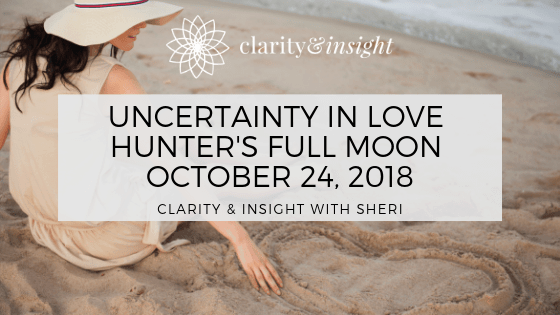 More than the season is changing – especially around relationships this Full Moon! Weakness in bonds will be highlighted and sudden changes in relationships or new love could happen with the flip of a switch. After all, the opposition of the sun in Scorpio and the full moon in Taurus shines a blaring light on what you can no longer ignore in your love life. Add in Venus opposite Uranus for a kick of excitement and uncertainty and you have a recipe for break-ups and make-ups. This combo focuses on what you want versus what you need in relationships and work-life balance. Take your time to really meditate on what you want moving forward. This is highlighted with Venus in Retrograde until November 16th, 2018. Things like stress and personal conflicts will leave you feeling physically and emotionally drained if you are not self-aware about the underlying dynamics at play. Operating in awareness is what allows for your growth here – what we don’t want to see is usually the thing we need to acknowledge. While this cosmic chaos ensues, remember – the Bull likes a comfortable, familiar pasture. These deep emotions, long forgotten, will make things unfamiliar and uncomfortable, but you must work through it. Emotional baggage that has not been processed is likely to show up as poor digestion, sleep issues, pain, weight gain, etc. 1.Taking care of your body. Taurus loves to be pampered, so schedule a massage, take a yoga class, cuddle up with your beloved while sipping a pumpkin chai latte. Add a dash of romance to warm up the winter chill. 2. A good cry, sometimes a good cry will open up and cleanse pent-up emotions, such as anger, sadness, heartbreak, and grief. 3. Write down your 3 biggest fears and read them out loud then burn the paper, freeing yourself from fears grip. Just simply identifying and acknowledging the monsters in our closets began the process. 4. It’s Autumn, savor the blessings and stay in gratitude. Devour each precious moment, basking in natures color show, and harvest the seeds planted on October 8th’s new moon. Start a gratitude journal. Acknowledge the good in your life and you will plant more seeds for good in your life. Want to know how this full moon will effect you? Schedule your personalized reading today!